After the success of the dumb Arabian Nights, Universal decided to give the genre another go with substantially the same cast—and we’re glad they did, because the second movie is 100% less dumb than the first. It starts out with an actual historical event, the 1258 siege and sacking of Bagdad by the Mongols of Hulagu Khan, and scenes of the massacre of the Bagdadis immediately set this film’s more serious tone. The Caliph is betrayed by his Grand Vizier and killed in a Mongol ambush (note to self: if Sultan or Caliph, do not have Grand Vizier), but the Caliph’s only son, Ali, escapes. Though historically the boy was captured by the Khan, here he gets away into the desert, where he stumbles upon the secret hideout of a band of forty thieves. And yes, the magic words “Open, sesame,” do open the lair’s stone doors, the only fantasy element in this film. To the bandits, Ali reveals his identity as the Caliph’s son, and their leader, Old Baba, adopts him as his own, hiding him under the new name Ali Baba. Old Baba appoints his aide, Abdullah—squeaky-voiced Andy Devine, here in brownface, best known for playing comic sidekicks in Westerns—to be Ali’s guardian and also, inevitably, his comic sidekick. Ten years pass, and Ali, now grown (and henceforth played by Jon Hall), has emerged as the leader of the gang, which he’s re-forged into a band of freedom fighters conducting a guerilla war against the occupying Mongols. The Forty Thieves now wear red and blue uniform robes, and they even have a theme song they sing while galloping across the desert! “We riiiiide … plundering sons, thundering sons, forty and one for all, and all for one.” Hmm, that part sounds familiar. Wait, so does the next part: “Robbing the rich, feeding the poor….” Okay, got it: the Forty Thieves are the Merrie Men. Robin, I mean Ali, is scouting a Mongol camp when he meets Lady Amara (Maria Montez) swimming fetchingly in the water of the oasis. The daughter of the treacherous vizier, she’s on her way to Bagdad to be married to Hulagu Khan—but as a little girl, she had been the boy Ali’s childhood sweetheart, so this marriage must be stopped! Swashbuckling ensues, with raids, abductions, and captures, in all of which Amara is aided by her loyal knife-throwing servant, young Jamiel (Turhan Bey—the rôle had been written for Sabu, but having become a naturalized citizen, the teen star had joined the Army Air Force to serve as a tail gunner in B-24s). 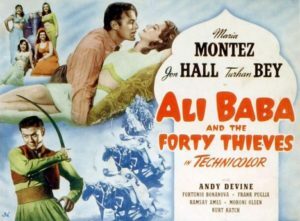 Ali decides it’s time for full-scale revolt against the Mongols, but gets captured himself, and to save him the thieves have to get smuggled into the palace inside forty man-sized oil jars—the only other nod, besides the cave doors, to the original Ali Baba story in The Arabian Nights’ Entertainment. In the end the uprising rises up in the nick of time, and—spoiler!—Lady Amara doesn’t have to marry Hulagu Khan. It’s not bad.